AEM Boost Control Solenoids are pressure-tested to an amazing 100 psi and will not leak. 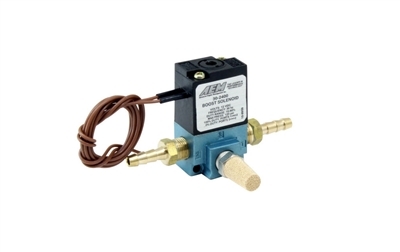 AEM Electronics boost control solenoid kits include -4 AN fittings so that you can securely attach wastegate lines without worrying about leaking at the connection. AEM also includes the barb-style hose fittings where push-on fittings are required. Boost Control Solenoid Kit. Includes everything needs for quick installation.